A wave patterned brocade material is a perfect choice for this uniquely designed shirt. 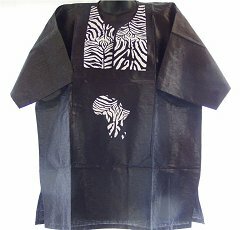 The brocade is appliqu�d with a 100% cotton zebra print to form the beautiful neckline and continent of Africa. The curved neckline closes to a trimmed 6″ folded neck opening. The 6″ Africa is positioned centrally about 3″ below the neck adornment. There are no pockets to detract from the smooth beauty of the brocade material. This is a truly elegant shirt. It measures 21″ from shoulder to shoulder, 26″ across the chest and 33″ from shoulder to hem.